Many physicians do not buy traditional long-term care insurance because they believe they will lose money if they don’t collect benefits. Now there’s a new generation of hybrid, asset-based products that provide crucial long-term care benefits while protecting your savings and legacy. According to LIMRA, a life insurance trade group, hybrid policies are becoming popular with more than 200,000 sold in 2015. Typically an asset-based or hybrid policy combines permanent life insurance with a long-term care rider. One key feature of this type of insurance is that you have a choice: you can pay a lump-sum premium up front or you can pay a level premium for a set term. In addition, another important advantage in some policies is that at any time, if you change your mind, you can get a portion or all of your money back if certain conditions are met. The combination of a long-term care benefit and a death benefit guarantees that you or your beneficiaries will collect some form of benefit. As long as the premiums are paid on time, you or your heirs can reap the benefits outlined in your policy. You can choose a single premium payment or payments divided over a number of years. So to recap, outlined below are reasons asset-based long term care insurance may make sense for you. If your premium payments have been made, the following benefits are guaranteed. 1. You can collect long term care benefits should you need this type of care. 2. If you never use the long term care benefit, there is a death benefit. 3. Based on a vesting schedule, in some policies, if you change your mind, you can get a portion or all of your premium back (minus any loans, withdrawals or benefits paid). A TMA Insurance Trust advisor can help explain how the combination of life insurance and a long-term care rider can provide the guaranteed benefits you may be looking for. We offer various options and riders from leading insurance carriers that may meet your individual needs and preferences. Don’t hesitate to let us help you compare plans and costs. 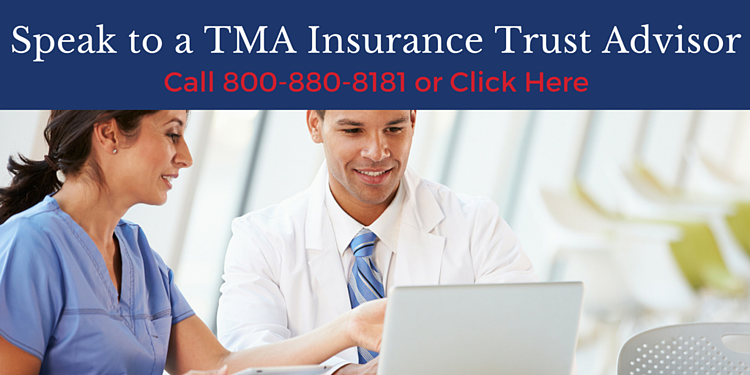 TMA Insurance Trust is a full-service insurance agency with over 60 years of experience helping Texas physicians protect their assets, family and practice. Advocating for members, TMA Insurance advisors offer unbiased information and strategies, along with exclusive group rates on a range of the highest-rated plans in the industry. And since advisors don’t work on commission, there is never any obligation or sales pressure. *Consult your tax advisor on your individual tax situation.